FAQs - Financial Risk Mitigation, Inc.
How do I get a consolidated / final invoice? A consolidated and final invoice for preparing settlement statements can be obtained by emailing the project/case name to accountsreceivable@frm-inc.com. Payment is required thirty (30) days from the date of the invoice. FRM accepts payment by ACH, Wire, and Check. Invoices contain remittance instructions. Who can I contact about accounts payable i.e. an invoice owed by FRM? How do I become a Subscriber / Client? To establish the framework for the business relationship, FRM must understand the nature of the prospective Subscriber’s (Client’s) business and intended use of FRM’s services. The prospective Subscriber should contact FRM for more information. Once we decide to become a Client / Subscriber, what information is needed? Contact details at a minimum must include: name, address, job title, telephone number, and email address. FRM generates an invitation email to each of Subscriber’s Report and/or Invoice Recipients to register for access to services at https://frmclientportal.com. What is a Client Head Designate? A Client Head Designate (CHD) is the User or Users authorized on behalf of a Subscriber to agree and subscribe to the Terms of Service by virtue of their authority as a member, shareholder, partner, officer, or as an employee authorized in writing by any of the aforementioned. The CHD is also charged with other administrative duties, including but not necessarily limited to, enabling, disabling, and approving Users of the Portal for the Subscriber. Are there any industries or types of clients that you don’t work for? FRM’s services are for commercial transactions, and not personal transactions. FRM generally restricts delivery of services to well known public and private clients whose needs for access to services is easily substantiated. How do I place an Order if I am a new User with an existing Subscriber? Please contact an existing User on the Subscriber account and request they invite you to participate on the Subscriber’s account by selecting SECURITY->INVITE NEW USER, or email the consultant assigned to your Subscriber account. Upon invitation, you will receive a registration email from the email address: register@frm-inc.com. Please follow the instructions in this email to register for services. Please note that a delay may exist between registering and approval of a User account. Before starting work, at least one Client Head Designate needs to be registered on the Subscriber’s account. All final reports are delivered to the Portal. Registration is mandatory to receive Reports. How do you ensure the legally compliant processing of Reports? FRM undertakes a number of steps to ensure it is legally compliant in processing Reports, including obtaining written representations from the Subscriber that is requesting Reports from FRM on a lawful basis and has obtained the consent of the Subject, where it it is needed, to perform the search. For Subscribers who may be accessing consumer credit reports from national reporting agencies like Equifax, Transunion, etc., FRM undertakes steps which conform with the national consumer reporting agencies’ requirements to credential Subscribers, which in addition to obtaining written representations from the Subscriber, includes the collection and review of certain documentation to establish the bona fide need to access such reports, and may also perform an on-site inspection at the Subscriber’s commercial location to verify they are undertaking basic security precautions at their commercial location. FRM also maintains an Information Security Program, administered by an employee or employees, which is anticipatory of foreseeable threats or hazards for attacks, intrusions, unauthorized access, system failures, alteration, destruction, or breach of confidentiality of FRM Content and Portal by way of: (a) using administrative, technical, and physical safeguards (collectively, “Safeguards”) to protect FRM Content and Portal; (b) reasonably designing, periodically reviewing, regularly testing, monitoring, and risk assessing Safeguards (collectively, “Safeguard Reviews”); and, (c) modifying and upgrading systems, system controls, procedures (including training of employees and management) as informed by the results of those Safeguard Reviews. FRM, as a part of its Terms of Service, also requires the Subscriber to represent they have such an Information Security Program in place as well. FRM also obtains specialized legal advice from privacy counsel for aligning its business practices with relevant law. Why did you access my consumer credit report? FRM accesses consumer credit reports according to the written instructions of the consumer to whom the report relates or other permissible purpose. In the event you were recently involved in a commercial transaction or being considered for employment, this most likely accounts for accessing your consumer report. FRM provides services to many financial institutions, well known investors, and employers. FRM is unable to provide any further information to a consumer on why a consumer report was accessed without following specific protocols relating to the disclosure. For further details on the process, the consumer should email compliance@frm-inc.com with the Subject Line: Consumer Credit Report Inquiry. In the event that the consumer does not have access to a computer, they may contact FRM toll free at 1-866-696-1583 or by toll at +1-504-620-0686. FRM accesses consumer credit reports according to the written instructions of the consumer to whom the report relates. In the event you were recently involved in a commercial transaction or being considered for employment, this most likely accounts for accessing your consumer report. FRM provides services to many financial institutions, well known investors, and employers. FRM is unable to provide any further information to a consumer on why a consumer report was accessed without following specific protocols relating to the disclosure. The consumer should email compliance@frm-inc.com with Subject Line: Consumer Credit Report Inquiry for further details on disclosure, identity theft, and dispute processes. In the event that the consumer does not have access to a computer, the consumer may contact FRM toll free at 1-866-696-1583 or by toll at +1-504-620-0686. How do I dispute information in my consumer report? FRM accesses consumer credit reports according to the written instructions of the consumer to whom the report relates. In the event you were recently involved in a commercial transaction or being considered for employment this most likely accounts for accessing your consumer report. FRM provides services to many financial institutions, well known investors, and employers. Who do I contact on questions about Reports? Please contact the consultant assigned to your Subscriber Account found on page 2 of all Reports, or the Analyst who authored the written report also on page 2. FRM’s email addresses are formatted: [firstname].[lastname]@frm-inc.com. How do I contact Financial Risk Mitigation, Inc.? FRM can be contacted by phone at +1-504-620-0686 during standard working hours and through its Contact page. Other specific contact information may also be located in the Contact category of FRM’s Frequently Asked Questions page. Standard hours of operation are Monday through Friday 8:00 am – 5:00 pm US Central Standard time. Time is -6 UTC. Who should I contact about additional information about privacy issues? If there are any questions upon reviewing any of the posted privacy policies, please email compliance@frm-inc.com. FRM provides services to financial institutions, sovereign wealth funds, insurers, endowments, institutional investors, family offices, foundations, Fortune 500 Companies, commercial real estate investors/lenders, professional service providers, government agencies, corporations, and sophisticated investors. What are the qualifications of FRM’s employees? FRM’s employees have diverse backgrounds, including those with legal, private investigative, banking, information technology, audit, and regulatory agency backgrounds. FRM develops best standard investigative due diligence services designed to meet specific requirements of the industries that it transacts in and the unique requirements to meet the objectives of specific engagements. Services can consist of searches and reviews of public records, media, corporate and regulatory filings, specialized databases, and interviewing. Different information is required depending on the type of order being placed. Please contact FRM for additional details. Do you accept Orders made outside of the Portal? FRM can process orders that are not initially placed on the order by other mutually agreed upon methods; however, before beginning work at least one User needs to be registered as a Client Head Designate and any User who wishes to receive a Report must be registered. FRM confirms orders with a Confirmation Email reflecting the case number, project name, subjects of research, scope of work, line item of charges associated with the scope of work, aggregate fees, and anticipated delivery date(s). Change orders are confirmed in writing by a re-confirmation email providing an updated set of details since the prior Confirmation or Re-confirmation email. What are the fees for Reports? FRM’s fee schedule for Reports vary depending on scope and volume of work. Contact FRM to discuss your specific reporting needs. Are you able to process orders on RUSH basis? •The known timelines in which a particular jurisdiction wherein research may be performed. Some counties in the United States, for example, may require a government employee to perform the search result in which case FRM and the Subscriber may be at their mercy and processing timelines. •FRM’s processing loads at a given point in time. Please contact the consultant assigned to your account for additional information in regards to processing RUSH orders. Do you charge additional fees for RUSHES? FRM does not usually charge additional fees for RUSH REPORTS; however, in certain circumstances where an inordinate number of rush searches become the norm, FRM reserves the right to re-negotiate fee structures. FRM fully recognizes that errors may occur from time to time in requesting searches in a timely fashion from FRM, that changes may occur through no fault of a Subscriber, and that new Subscribers may be formalizing processes and procedures and other organizational measures. What is the difference between a Standard, Rush, and Drop Dead Order? FRM codes cases as STANDARD, RUSH, and DROP DEAD. STANDARD ORDERS are processed according to standard timelines as a part of FRM’s Service Level Agreements with clients. RUSH ORDERS are processed on a “Best Efforts Basis” with an timeline earlier than a STANDARD. DROP DEAD ORDERS are cases where a Subscriber has communicated a specific date by which a Report is required outside of Standard timelines. What exactly qualifies as a STANDARD, RUSH, or DROP DEAD timeline is determined by the complexity of the subject of research, scope of work, and location where work is being performed. Please contact the Marketing Consultant assigned to your Subscriber account for specific details on Report Timelines. Do you offer Reports on companies and individuals? What differences exist in Reports in the US verses non-US, International reports? Different countries have different record keeping systems, legal indexes, and privacy laws from the United States. Access to certain data in other countries may require additional releases or have different processing requirements. What countries/service areas are Reports available? FRM provides services in all locations where the US maintains diplomatic relations, and FRM is not otherwise barred from transacting due to sanctions, embargoes, or other restrictions. Why is a NY CRIM REC Fee appearing in my Confirmation Email or Invoice? The New York Unified court system currently charges a $65 fee for criminal record access as of 2018. The rate is currently the highest rate in the United States for accessing criminal records. For certain scopes, this is a pass-through charge specifically referenced as a separate scope of work on individual subjects who may be residing or working in New York State. It is noted in Confirmation Emails and Invoices from FRM as NY CRIM REC FEE. How does FRM comply with the General Data Protection Regulation (GDPR)? The General Data Protection Regulation (GDPR) will replace and supercede EU member-state privacy rules. GDPR has a compliance date of May 25, 2018 for organizations to bring their policies and procedures into conformity. GDPR fines can be up to EURO 20mm or 4% of revenue, whichever is higher. FRM has worked with its EU-based and US-based privacy counsel to examine our business practices and processes to confirm conformity with EU/EEA data and privacy laws. As a result, FRM is a participant in certain legal frameworks that have been determined to meet the stringent GDPR requirements governing the transfer of information on EU-based Data Subjects outside of the EU. Accordingly, Users should be aware that the EU Commission has deemed the “EU-US Privacy Shield Framework” to be an adequate mechanism under EU law to enable data transfer to the United States. On January 12, 2017, the Swiss Government announced the approval of the “Swiss-EU Privacy Shield Framework” as a valid mechanism to meet Swiss data protection requirements when transferring data from Switzerland to the United States. FRM is a participant in the Privacy Shield programs, and has certified participation with the US Department of Commerce, verifiable here: https://www.privacyshield.gov/participant?id=a2zt00000004TmVAAU&status=Active. FRM’s EU-US Privacy Shield Policy has been reviewed by Department of Commerce. FRM is required to make the Policy publicly-available. The Privacy Shield Policy is found here: https://www.frm-inc.com/privacy-shield/. In short, the Policy is an attestation that FRM will process data in conformity with EU/EEA data processing requirements and provides model contract clauses for onward-transfer of data to countries which are not recognized as having adequate data and privacy protection laws, such as the United States. Accordingly, FRM has also made some changes with respect to our standard Terms of Service publicly-posted here: https://www.frm-inc.com/frmclientportaltermsofservice/. Sections1(h); 1(l); 1(q); 1(s); and Section 4 are changed as a result of GDPR implementation. • FRM is relying on our Subscribers to obtain a GDPR-compliant Notice and Consent from the Data Subject, and the Subscriber will make use of the information in conformity with GDPR rules. •As a part of the Notice and Consent, or under separate notice, the Subscriber must point the Data Subject to FRM’s Privacy Shield Policy. • In the event a Subscriber is not obtaining the required Notice and Consent, an affirmative burden is placed on the Subscriber to provide the legal exception to processing the personal data of the Data Subject. There are a number of exceptional circumstances where a Subscriber can assert it has a legitimate interest to process personal information of a Data Subject in the EU/EEA without the legally required Consent. Unfortunately, exceptional bases are not uniform throughout the EU/EEA. For example using Anti-Money Laundering laws as the basis for an exception, would be entirely appropriate for some Subscribers in the UK or Germany, but not for Subscribers in other EU/EEA countries. Since FRM is not in a position to exactly state what our Clients’ use of the data is, we are not in a position to craft for the Subscriber the exact Notice required by GDPR. As a practical measure for Subscribers that are struggling with GDPR, FRM has drafted a Notice and Consent form that should work for most Subscribers’ needs, but the Subscriber must evaluate the form against the Subscriber’s own policies and use of data. FRM is not a law firm, and therefore is not in a position to provide legal advice to a Subscriber as to whether the release form reflects the actual practices of any organization relying on the form. FRM does not redistribute the report created for the Subscriber, and FRM does not re-use the data of EU/EEA-based Data Subjects for a purpose for which the data was not originally obtained. FRM relies on the general instruction of the Subscriber to allow FRM to use sub-processors and to undertake steps to make sure that sufficient protections exist with respect to technical and organizational measures pertaining to data protection. FRM has endeavored to develop a business process that is practical, prudent, and balanced, and that is also strictly compliant with GDPR. FRM is not in a position to advise Subscribers regarding whether a specific Subscriber’s notice may be sufficient because of the myriad uses, laws, rules, and regulations which may form the basis for processing the information; however, FRM may reject forms which in FRM’s opinion do not meet GDPR processing requirements. How do I get technical support for the Portal? FRM has a few self-help videos which are able to simply resolve most technical support issues. You may also email security@frm-inc.com for additional help. FRM currently supports Internet Explorer and Edge browsers. All windows based operating systems have Internet Explorer installed by default and the browser cannot be uninstalled. How do I configure Compatibility View settings on Internet Explorer? The Portal works with Microsoft Edge without any setting changes. For Internet Explorer, please view the video below for setting changes which do not require the intervention of your IT Department. Is an overview available on using the Portal? How do I place an Order on the Portal? Log into the Portal at https://frmclientportal.com and use the following video as a tutorial. Are there different security settings for Users on the Portal? Client Head Designates have access to all Report information for the duration of the data retention period, usually five (5) years. Client Head Designates can approve new and/or lock Users on their Subscriber account. By default, Users are restricted to data they create or which they may specifically be authorized by other approved Users to access. Users have access to approved data for a six (6) month window. Users can be enabled with a Report Library setting allowing access to all Report Information for the duration of the Subscriber retention period. Users may be enabled to both place orders and/or only view orders. Accounting Users, if not enabled with other security settings, can be restricted to invoice data only. Why do you perform entitlement reviews? FRM is committed to information security and a standard practice is to perform periodic entitlement reviews to determine if Users may still need access. FRM interacts with Client Head Designates to determine which Users on the Subsriber’s account that have a continued need for access. What type of management tools does FRM offer? 1. FRM provides a case management Portal to Users which provides an archive of Recently Completed, Pending, and Historical Reports along with associated invoices. 2. For high volume Subscribers, FRM can provide data on all projects, subjects, scopes of work, creation dates, delivery promise dates, and actual delivery dates with a specified date range on output. 3. FRM can supply User login activity, IP address, and reports accessed to assist Subscribers who may need to perform entitlement reviews. Who should I contact in the event my Portal account becomes locked? Please email security@frm-inc.com, email the Consultant assigned to your Subscriber account, or call +1-504-620-0686 during working hours. Do you have a User Manual on the Portal? 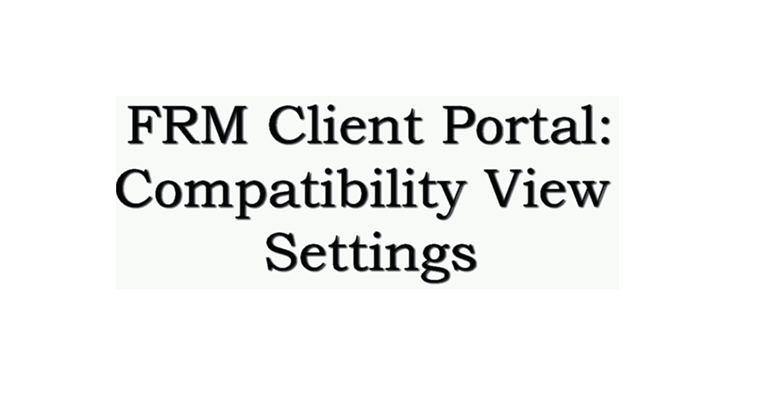 A User Manual is available to registered Portal Users upon logging in under the USER GUIDE tab. FRM maintains an Information Security Program, administered by an employee or employees, which is anticipatory of foreseeable threats or hazards for attacks, intrusions, unauthorized access, system failures, alteration, destruction, or breach of confidentiality of FRM Content and Portal by way of: (a) using administrative, technical, and physical safeguards (collectively, “Safeguards”) to protect FRM Content and Portal; (b) reasonably designing, periodically reviewing, regularly testing, monitoring, and risk assessing Safeguards (collectively, “Safeguard Reviews”); and, (c) modifying and upgrading systems, system controls, procedures (including training of employees and management) as informed by the results of those Safeguard Reviews. Report data and Subject data are set to purge by a default period of approximately five (5) years from the date of Report completion. Electronic systems such as messaging systems, file servers, and database servers are configured to purge data at this juncture. Paper files are also destroyed on a similar schedule. A lag may exist in purging electronic data from primary systems through back up systems. Paper file destruction may also lag based on the date a file was shipped for destruction. How long do Reports take to complete? Standard timeline reports in the United States are timed generally for 7 to 12 business days depending on the complexity of scope of work. Rush reports are processed in shorter time frames on a “Best Efforts Basis”. Reports outside of the US generally take between 12 and 15 business days to complete. Rush reports are also accepted on a “Best Efforts Basis”. Report pricing depends on scope of work, complexity of subjects, and location where research will be performed. Please contact FRM for additional details. Financial Risk Mitigation, Inc. delivers final reports results to https://frmclientportal.com to meet information security and compliance objectives. How can I check on the status of a Report? Report status can be confirmed by logging into https://frmclientportal.com or emailing the Consultant assigned to your account. Recently Completed Reports i.e. Reports completed in the last 7 calendar days, are listed on the landing page immediately upon logging in, or CASES->RECENTLY COMPLETED. Pending Reports are under the CASES->PENDING tab. Historical Reports (Reports that are more than 7 days old) are under the CASES-> HISTORICAL tab. FRM understands the events which can lead to delays in its written deliverable reaching its clients, given the high volume of reports which its management has been involved in the production for 15+ years. FRM proactively alerts clients on potential Report delays at the outset of the Order, or in the event a promised timeline (as part of its Confirmation email) may not be able to be met. •Incomplete Information submitted by client e.g. improperly stylized entity name, no credit release, no county and state information on entities as to where to search, etc. •Original venues of research specified may require expansion as warranted by address histories of individuals and/or business activities of entities. Delays relate to budget approvals for expansion of research. •Common names leading to multiple false positive hits requiring high level, slow manual reviews. •Archived Information requiring additional processing timelines. •Force Majeure – courthouse computer systems down, snow storms, etc. What type of information is included in your Reports? Reports may include records of criminal, legal, regulatory, corporate, credit, asset, and media filings, in addition to, verifications of biographical details and results of interviews and investigations undertaken. What are your research methods? FRM employs on-site researchers to gather information directly from the repositories which may hold such information, in conjunction with industry standard database technologies. What makes you different from other similar Providers? What items do your Terms of Service generally cover?